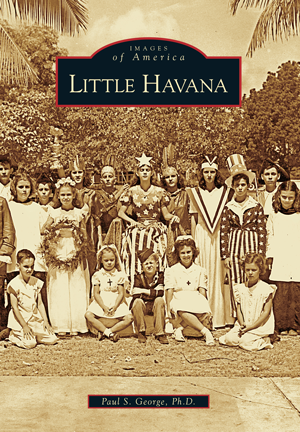 By Paul S. George Ph.D.
For the past 50 years, Cuban refugees and Central American immigrants have moved to an old quarter of Miami known as Little Havana. This internationally known community is famous for its sizzle, its heated ethnic politics, its entrepreneurial zest, and its colorful street life and celebrations. Before it became Little Havana, the area was home to a vast array of people, including white and black Bahamians, Jews, people from parts of the Middle East, and folks with Deep South pedigrees. The quarter's most famous neighborhoods then were Riverside and Shenandoah. Riverside emerged from the piney woods at the start of the 19th century and hosted some of the earliest city institutions, as well as picturesque homes and tree-shaded streets. Shenandoah was farmland as late as the 1920s, before a real estate boom transformed it into a neighborhood of gorgeous Mediterranean Revival–style homes. Southwest Eighth Street, the famed Calle Ocho, once divided the two neighborhoods, but the vast influx of Hispanics erased that division as the thoroughfare developed its own identity. Paul S. George, Ph.D., is a professional historian who teaches at Miami Dade College. The Little Havana resident also serves as historian to the Historical Museum of Southern Florida. George conducts more than 35 different historic tours, including several in Little Havana.